The Zion – Mount Carmel Highway was proposed by the Utah Parks Company, which managed tourist concessions in Zion National Park, as a means to link Zion with Grand Canyon National Park and other attractions in northern Arizona. The road runs from the entrance to Zion eastward to Mount Carmel Junction with US 89 as a portion of Utah State Route 9. The road became part of a loop tour of Zion, Bryce Canyon, Cedar Breaks and the North Rim of Grand Canyon National Park. The route was surveyed in 1923 by B.J. Finch, district engineer of the US Bureau of Public Roads, Howard C. Means, a Utah state engineer, and John Winder, a local rancher. 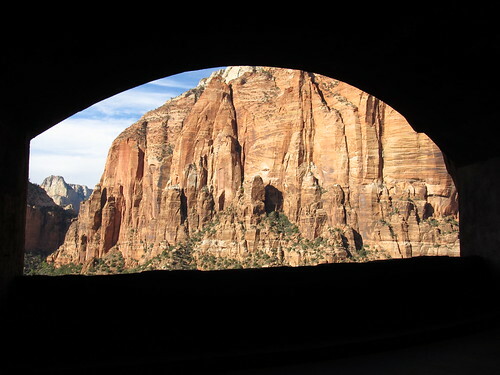 The National Park Service evaluated alternative routes, including one that used Parunuweap Canyon, but settled on the Pine Creek route, which required a tunnel through the Great Arch. Detailed design work on the road was carried out by the Bureau of Public Roads. Details including bridges, retaining walls, culverts and other features were designed by the National Park Service Branch of Plans and Design under the supervision of Thomas Chalmers Vint. Work began in 1927 on a total of 25 miles (40 km) of road, which was completed in 1930. The highway features a 5,613-foot (1,711 m) tunnel that follows the profile of the Pine Creek Canyon wall at a consistent distance of 21 feet (6.4 m) from the outside face of the rock to the centerline of the tunnel. The west portal is framed by a masonry facade of cut sandstone, while the east portal is a naturalistically formed hole in the rock, entered directly from a bridge. Construction proceeded using mining techniques rather than traditional tunneling techniques, starting from a stope and working outward to the portals. The tunnel uses galleries to provide light and ventilation through the canyon wall to the outside air. The galleries also provided a place to dispose of rock generated during construction, which was dumped through the galleries into the canyon. Parking spaces were originally provided at the galleries, but were discontinued due to safety concerns. Some galleries have been repaired and partially closed with concrete due to damage from rockslides. The interior of the tunnel is rock-faced, with concrete reinforcement at selected locations. Work on the tunnel was started in 1927 by the Nevada Construction Company and was completed in 1930 at a cost of $503,000. At the time of its completion it was the longest non-urban road tunnel in the United States. The tunnel's restricted dimensions require that vehicles over 11.33 feet (3.45 m) in height or 7.83 feet (2.39 m) in width give advance notice so that two-way traffic can be shut down in the tunnel, allowing oversize vehicles to proceed down the center of the tunnel. Vehicles over 13.08 feet (3.99 m) tall and semi-trailers as well as bicycles and pedestrians are prohibited in the tunnel.